Here is an experimental set-up utilizing "slucket buckets" in a, more or less, DIY configuration. Slucket buckets have sloped bottoms along with a bottom port allowing for improved drainage over conventional RDWC type set-ups. Water is injected from the bottom ports on each of the growth modules while water is removed from the bottom port at the reservoir. Return from each of the growth modules is via a 3 inch diameter pipe. 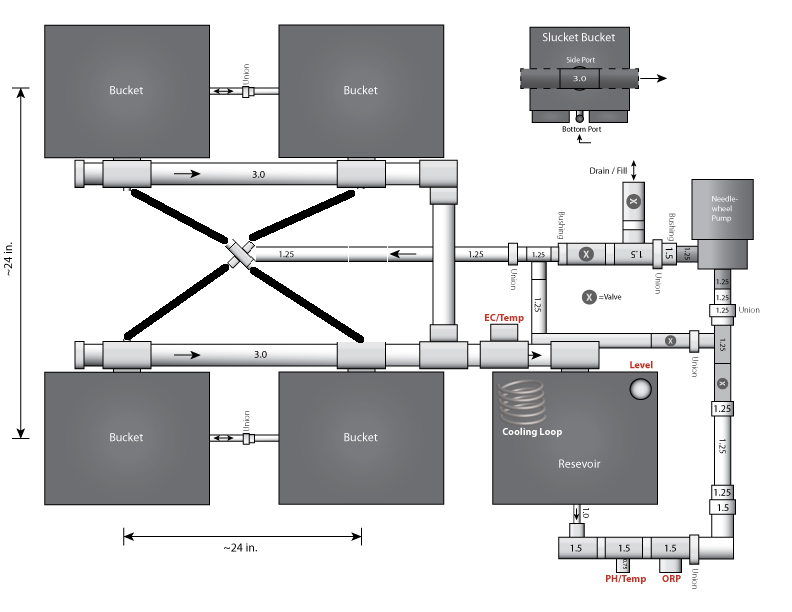 Several valves comprise the pump manifold allowing the direction of flow to be modified for filling the system, for run-time operation, and for pump assisted draining of the system. There are a couple of goals, here. 1) attempt to eliminate air pumps/stones through the use of a needlewheel pump and venturi 2) online process monitoring 3) serve as an experimental platform for a variety of ambitions. The various online probes are fed to milliamp transmitters which are then converted to streaming ethernet data. A remote embedded system provides monitoring/control. Included but not shown in the above are environmental CO2, humidity, and temperature sensors along with actuators for lighting control and CO2 injection. Lot's of work in progress here and may eventually integrate some "fancy" experimental sensor elements if the initial trial is successful. Air is injected before the needlewheel pump at a controlled rate to ensure sufficient pump suction at the reservoir. 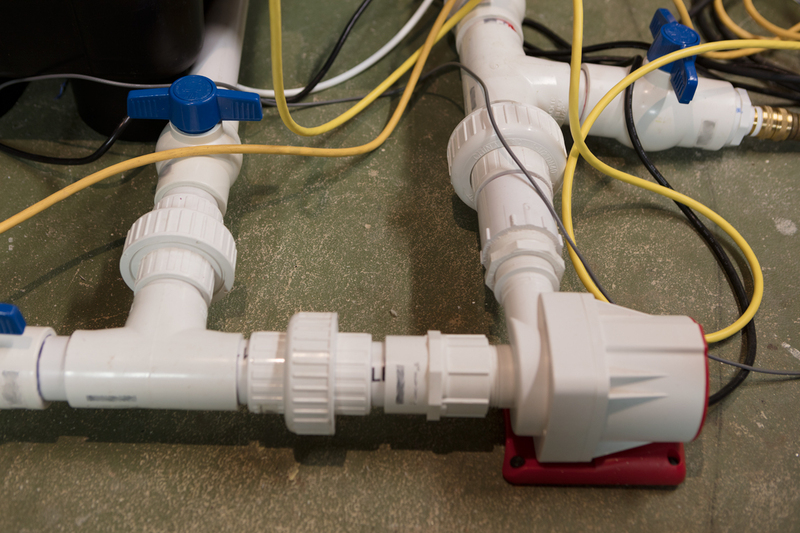 The air injection mechanism is nothing more than a polypropylene tube jammed into the water outlet pipe (bottom port) in the reservoir. The water velocity is sufficient that a venturi effect is produced creating vacuum on the air inlet. Eventually this set-up will be moved into a growth space for real-world data collection. There are already several non-optimal things I've noted with this configuration but I'm thinking they're relatively minor at this point. Can always go back and hack in fixes, eventually. 1) Started with a commercial venturi for air injection but it proved to be way too restrictive on flow. The needlewheel pump would cavitate and I had to remove it. Instead I just jammed a small tube into the pump inlet for now. 2) Configuration was arranged with the hopes that there would be sufficient pressure balancing between the four growth modules. Bypass piping was placed between the units in order to achieve this but, as it turns out, was not sufficient. The first two units receive greater flow. Simply modifying the length of tubing supplying the first two units (or otherwise) should resolve this (using flexible SPA tubing). 3) Air injection appears to be working ok but I would like to see finer micro-bubbles appearing at the growth modules. There could be several reasons for this including overall velocity of flow over distance, the venturi problem as noted, needlewheel pump improvement or, perhaps, not achievable. Needs experimentation. Thanks LC. Yes, Exactly. Something like you've drawn would balance the flow better. Good idea. ORP is the acronym for oxidation-reduction potential. This is essentially used to measure the oxidation potential of a solution. With this you could measure a variety of things occurring in solution such as the inclusion/quantity of bleach in solution (or other oxidizing compounds) or, possibly, the detection of an infection for instance. This is not a common measurement for hydroponics growers. The needlewheel impellers are much less efficient in moving water but they are very good at breaking up gas bubbles into very fine bubbles. Using a venturi or other mechanism to introduce air into the water being drawn into the pump results in an output containing many finely "chopped" up air bubbles. For an aquarium skimmer, the resultant small bubbles capture bits of protein and gunk in the foam that is created. In essence, cleaning the water. For hydroponics, the intent here is to replicate the effect of an airpump + airstones using the same pump that is also moving the water. The bubble infused water eventually reaches each of the grow modules. Hopefully, this results in an oxygen saturated solution. Currently, I can say the solution is saturated as measured by an LDO probe but I will not know if this technique is efficient enough until I get something growing (since, a solution will naturally saturate over some time constant). One of the various experiments to try. "Mixing liquid and gas components is another application of Venturi tubes. This is possible because the lower pressure inside the tube creates a pressure difference between the device and its surrounding environment. Substances outside of the Venturi tube are sucked into the low-pressure area, and gas and liquid components become mixed together within the device." In this case, all I did was jam a piece of tubing into the pipe feeding the pump (where pump suction must be sufficient). This creates a constriction to the flow (A2 in the illustration) while, at the same time, generating a vacuum in the tubing (sucking in air). This is all that is needed to inject air before the needlewheel (not the best, there are better ways, but good enough for the moment me thinks). Very interesting idea. I had completely forgotten about needle wheel pumps. I would assume they put less heat into the system than submersible pumps. That combined with the super fine air bubbles seems like a good idea to me. As to heat generation, I would think there would be efficiencies gained here by not immersing the pump. Heat generated goes somewhere whether the solution or the environment. I would think it's probably easier to control where it ends-up by keeping the pump external (either in the same room or somewhere nearby). I'll look into generating some thermal images to get an idea how the pump radiates. Could still be sinking the bulk of the heat into solution (liquid lubrication? ), I don't know. I have seen the use of needle wheel pumps being discussed in the past across the various forums for similar application. So, yes, not a new concept. But, I'm a bit surprised that I haven't seen them discussed as often as I'd expect. Generally the ideas seem to revolve around immersion in the control reservoir for oxygenation. Or, at least, I haven't come across applied examples/results of them being utilized as an overall system pump. I'm looking forward to report the results at some point here along with discussing the thoughts/experience of others. Ok, I've captured a thermal image of this particular pump as currently configured. 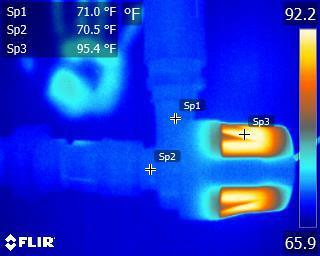 The following is a thermal image of the pump. See the photos posted earlier to get a better idea of what you're actually looking at. Notice that there is a slight discrepancy of the measured temperature with the thermal camera when compared to the physical measurement of the solution and environment. This is probably due to setting the emissivity of the measured surfaced correctly. Which, is only estimated in this case. But, that doesn't matter so much since we are simply interested in the relative differences for the most part. So, what we see is that there may be a slight temperature increase between the inlet and outlet of <= 0.5F. But, as expected, there is a significant amount of thermal dissipation from the actual housing to the surrounding air. 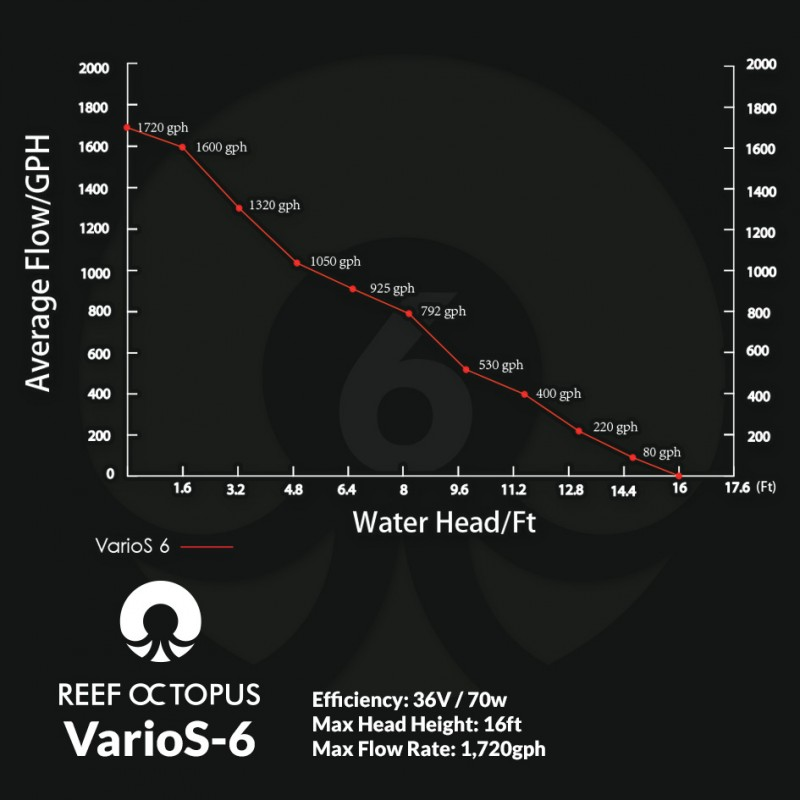 Measured temperature of the housing has a maximum of around 95 F.
For those interested, the pump is a Reef Octopus VarioS 6S and is running at full speed for this test. That was a good idea for a test, thanks Larry. 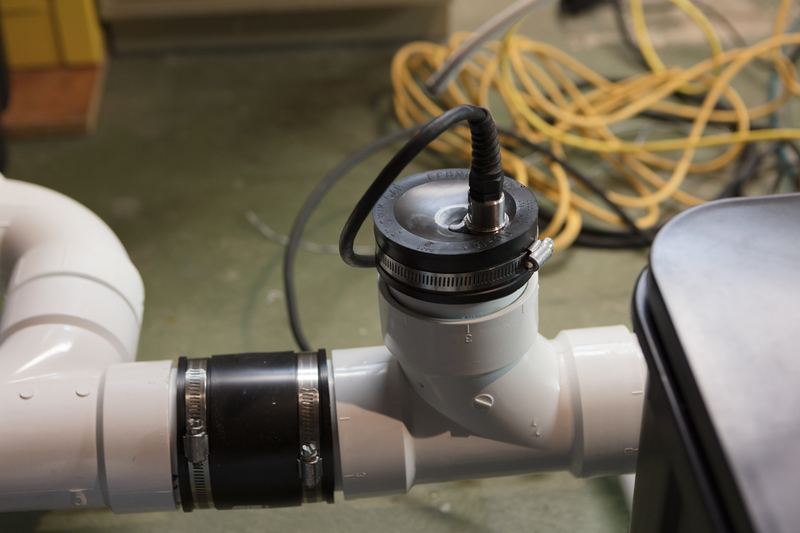 You are the first person I have seen using an ORP probe, are you finding it worthwhile? I had a look at them, but decided the cost to benefit ratio was not good enough. What has been your real world experience? Yes, don't know if it'll be useful yet. Still setting up things and building the components for this platform. Haven't used ORP probes before this (and for that matter don't know how reliable they are). Time will tell if they are worth the trouble. Plan is to data log the sensors for correlation to "events" in a grow. E.g., over instrument the system then look for the interesting trends. Over time, It'll probably be interesting to run both a live and dead solution while logging the data for interpretation. Any thoughts for experiments or test parameters would, of course, be welcome. Probably won't be until later in the year that I'll actually get this moved into an real-world growth experiment, though. Very cool thermal image! Looks like that pump is not heating the water to any significant degree. To my mind, that makes it an excellent choice as an external circulating pump. Any idea what kind of flow rate you are getting or what the "head" potential is? Fascinating stuff here. I concentrated on building a system as simply as possible. 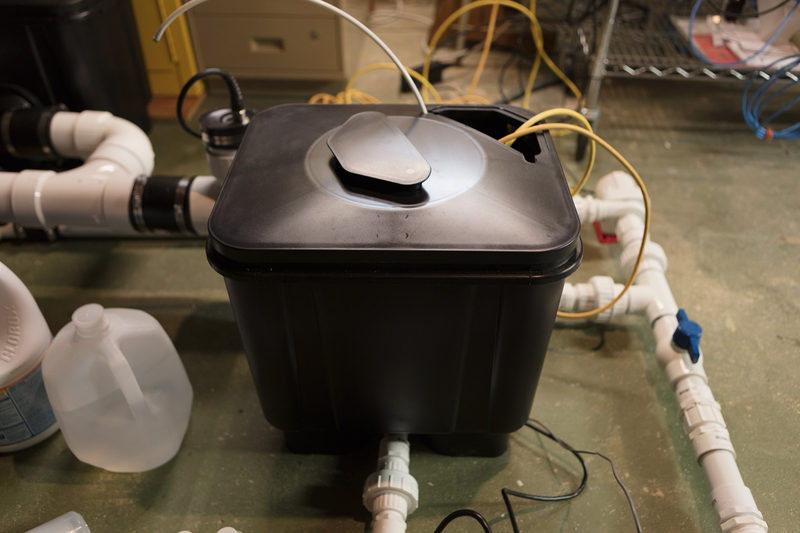 It turns out that it isn't hard to oxygenate water, so I just placed the inlet in the lid of each RDWC tubsite and the resulting waterfall does the job nicely. 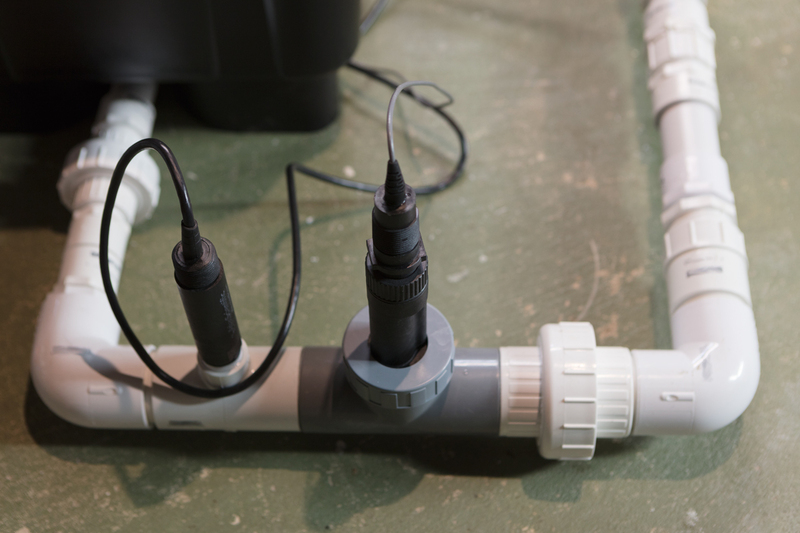 One pump for the whole system, no PVC, just flexible tuning and irrigation fittings in 1" and 1/2" sizes. My plants have yielded over 2 pounds of finished product. Hi Larry. Rating for this pump with the needlewheel impeller (varios 6S) is 530 GPH. I unfortunately don't have a good way to measure the actual flow rate or head at the moment (hmm, something to investigate). I could not find a chart specifically for this pump model. For the setup, actual liquid height over base is probably around a foot. From casual observation, flow looks sufficient but will circle around to this later for a measurement. The animated gif in the first post is from one of the buckets. "The chemical environment needs to have an ORP of above 600mV to eliminate harmful fungal spores and bacteria. Of course this means that if you want to run a sterile hydroponic environment you'll want to keep the ORP of your solution probably in the 300-500mV range, large enough to prevent any micro-organisms from growing but low enough to prevent any damage from happening to your roots." "The ORP will also give you signs about water oxygenation and biological activity within the water. A reductive environment - ORP below 100mV - will mean that there is a significant number of substances in the solution that want to give electrons and these substances are generally organic acids, bacteria, viruses or other organics molecules, like reductive sugars." So possibly useful for a variety of situations. For instance, what happens to the ORP when one adds amino acids to the solution? How about beneficials? Can we tell if they survive or when they die off? Is it even measurable? How does this effect O2 levels? etc. I don't know the answers to these. There is plenty of anecdotal evidence abound but not always enough empirical evidence. Would like to answer some of these or at least satisfy my curiosity. Growing something is actually a secondary goal for this platform Blaspheme! Hear, Hear. Yep, simplicity would be the way to go! You are absolutely correct. Though, I'm hard headed at times and, as such, the actual intent and ambition in this case is to serve something a bit different. But, as they say, the best-laid plans of mice and men often go awry! Extra complexity ALWAYS comes back to bite you. I use temperatures in the 60s and the waterfalls. Not only does it keep the system free of pathogens but even when I deliberately poured water from rotten roots into the system, nothing happened. I'm a much bigger fan of using natural processes to keep things in balance than poisonous chemicals. Hello Ttystikk, the "complexity" is quite intentional in this case. And yes, your system sounds like a well tuned machine. Not doubting it at all. Though, I will say that this thread is not about the use of poisonous chemicals. ORP is a abbreviation for oxidation reduction potential, there is some additional description earlier in this thread. Similar to measuring PH. I'm not here to criticise. I think the addition of instrumentation is an excellent idea. Can one increase the Oxidation Reduction Potential simply by continuous oxygenation via waterfalls, etc? I concentrated on building a system as simply as possible. From casual observation, flow looks sufficient but will circle around to this later for a measurement. The animated gif in the first post is from one of the buckets. If you're getting that much flumming on all 4 buckets at the same time, it looks like enough to me. I would think that would give you close to 100% DO even without the needle wheel impeller. It turns out that 100% saturation of dissolved oxygen is not hard to achieve. To increase absolute levels of DO, reduce water temperature. If my system temperature drops into the 60s at least once every 24 hours, it does fine. The flip side of this is that allowing the water to warm up encourages higher metabolism and growth rates in the plants, all else being in order, of course. Not at all, I get it. Thank you for the input. Just clarifying that there is a broader ambition that goes beyond growing at play. Hopefully, I'll be able to share some data in the future that someone would find useful. Some of which may simply be confirmation of general knowledge or maybe there's something that will be helpful for other experiments. In fact, I can envision times where I'm purposefully stressing the plants. In principal, yes. Though, an ORP probe is not selective for oxygen specifically and will instead detect changes in the reduction potential of a solution in general. It measures whether the solution has a tendency to acquire or contribute electrons, net positive or net negative at a specific point in time. Or, as a trend for on-going redox chemistry. ORP could be good at measuring DO at exceeding low levels (anaerobic conditions) but is not as precise for measuring elevated DO. A DO probe (or other analytical method) would likely be a better choice for measuring what would be the typical DO in a hydroponic solution. Why do you want to eliminate the air pumps?